Well, it's been four entire months since the last update, and there's actually not much news to report. Sheba is more mature now; a little taller, a little longer, a little heavier. She's every bit as loveable and cuddly as before, and to this day is happiest when she's snuggled up tightly against either Linda or myself on the sofa. She is perfectly behaved at all times, never gets into trouble. She has long since outgrown her huge crate that she used to love sleeping in, but as it became too cramped she has now taken over the main level of our home, and can sleep in her huge doggie bed, or curl up on the sofa. Sheba suffered through yet another bout of Panosteitis in late September, (her 8th flare-up) but hopefully that will be the last of her growing pains... because surely she must be pretty much done growing by now, right?! * The first chart shows her weekly weigh-in results, along with the amount that she has gained each week. * The second chart shows her monthly weigh-in results in comparison to that of an average female German Shepherd. It also shows the amount that she has gained each month, as well as how much her weight is above that of an average female. 08 (Oct 07/17)...... 14.0 lbs...... 2.1 lbs. 09 (Oct 14/17)...... 16.7 lbs...... 2.7 lbs. 10 (Oct 21/17)...... 19.5 lbs...... 2.8 lbs. 11 (Oct 28/17)...... 22.5 lbs...... 3.0 lbs. 12 (Nov 04/17)..... 27.0 lbs...... 4.5 lbs. 13 (Nov 11/17)......30.0 lbs...... 3.0 lbs. 14 (Nov 18/17)..... 32.0 lbs...... 2.0 lbs. 15 (Nov 25/17)..... 34.5 lbs...... 2.5 lbs. 16 (Dec 02/17)..... 38.0 lbs...... 3.5 lbs. 17 (Dec 09/17)..... 42.5 lbs...... 4.5 lbs. 18 (Dec 16/17)..... 43.5 lbs...... 1.0 lbs. 19 (Dec 23/17)..... 45.0 lbs...... 1.5 lbs. 20 (Dec 30/17)..... 47.5 lbs...... 2.5 lbs. 21 (Jan 06/18)..... 49.0 lbs...... 1.5 lbs. 22 (Jan 13/18)..... 52.0 lbs...... 3.0 lbs. 23 (Jan 20/18)..... 53.0 lbs...... 1.0 lbs. 24 (Jan 27/18)..... 55.0 lbs...... 2.0 lbs. 25 (Feb 03/18)..... 56.5 lbs...... 1.5 lbs. 26 (Feb 10/18)..... 52.0 lbs..... -4.5 lbs. 27 (Feb 17/18)..... 55.0 lbs...... 3.0 lbs. 28 (Feb 24/18)..... 58.0 lbs...... 3.0 lbs. 29 (Mar 03/18).... 58.5 lbs....... 0.5 lbs. 30 (Mar 10/18).... 60.5 lbs....... 2.0 lbs. 31 (Mar 17/18).... 63.0 lbs....... 2.5 lbs. 32 (Mar 24/18).... 66.0 lbs....... 3.0 lbs. 33: (Mar 31/18)... 69.0 lbs....... 3.0 lbs. 34 (Apr 07/18)..... 72.0 lbs....... 3.0 lbs. 35 (Apr 14/18)..... 75.0 lbs....... 3.0 lbs. 36 (Apr 21/18)..... 76.5 lbs....... 1.5 lbs. 37 (Apr 28/18)..... 78.0 lbs....... 1.5 lbs. 38 (May 05/18).... 80.0 lbs....... 2.0 lbs. 39 (May 12/18).... 82.0 lbs....... 2.0 lbs. 40 (May 19/18).... 83.0 lbs....... 1.0 lbs. 41 (May 26/18).... 84.0 lbs....... 1.0 lbs. 42 (June 02/18)... 85.0 lbs....... 1.0 lbs. 43 (June 09/18)... 86.0 lbs....... 1.0 lbs. 44 (June 16/18)... 86.0 lbs....... 0.0 lbs. 45 (June 23/18)... 86.0 lbs....... 0.0 lbs. 46 (June 30/18)... 87.0 lbs....... 1.0 lbs. 52 (Aug 12/18)..... 90.0 lbs....... 3.0 lbs. Sheba has finally recovered from a particularly lengthy and rather severe bout of Panosteitis, which if you have been following this journal, is just a fancy word for "growing pains". This was her sixth Pano flare-up since January, and this time it lasted for a full nineteen days, of which she spent most of her time just laying there looking pretty pathetic and with no apetite. But we're happy to report that she is now finally back to her frisky old self; a healthy, happy, oversized puppy-dog once again! A few days ago I happened to notice that as Sheba was walking past me she appeared to be even taller, if that is at all possible!! Well, we measured her and, sure enough, our girl is still growing, which would definitely account for her latest bout of Pano. It is quite shocking that at less than eleven months of age she already measures a very tall 28 inches at the shoulders, (with a rather massive 30+ inch chest circumference) Good Lord, it's like having a horse in our living room! Her new harness should be arriving in our mail within the next few days, and once it is correctly fitted/adjusted, I will take some new photos of our gentle giant with her new Bling and post them to the gallery. Sheba is nine months old today and has fully recovered from her most recent Panosteitis flare-up; is now back to her usual playful, snuggly self. She's still not eating her kibble, but compensates with plenty of turkey, pork and beef. She continues to gain weight, (currently at 82 lbs) and stands 27 inches high, (at the shoulders) though due to her oversized frame she remains quite slim. Well, I suppose we shouldn't be too surprised. With the way Sheba continues to sprout, it was inevitable that another bout of the dreaded Panosteitis was just around the corner! Every time that she experiences a sudden growth spurt, it's a pretty safe bet that she will soon be back to limping from the growing pains once again. Sheba managed to go seven straight weeks this time without any symptoms of that nasty "Pano", but after another sudden (and quite obvious) increase in her height and weight, our girl has been favouring her right front leg. Just like the past two flare-ups, Sheba doesn't seem to be in too much pain, but it's obvious that she's feeling some amount of discomfort when walking. But she's still eating/drinking, unlike the last episode, when she went completely off her food, and lost several pounds in just a few days. And she remains very happy/cuddly this time; is still very playful, with us and her toys, whereas last time she would just lay there looking pretty miserable. Anyway, so far so good, but we're keeping a close eye on her, and if the symptoms worsen we may have to travel to the mainland to see the vet. But I must say that she has been doing remarkably well, up until this past week. Sheba just turned eight months old three days ago; she continues to grow and grow, and is already a fairly enormous girl! I weighed her yesterday and she is 75 lbs, while remaining quite lean. She currently stands 26-1/2 inches tall, (at the shoulders) and has a very long body to match her height. Here's hoping that Sheba will soon be finished with the growing... though at the same time, we're keeping our fingers crossed that she doesn't lose her appetite again, as we fear that she could very quickly become a walking skeleton! I am very happy to report that Sheba has been doing terrific in recent weeks! She will be 7-1/2 months old next week. (32 weeks today) Within two weeks of her spay surgery, she had fully recovered from the ordeal. I removed her stitches after 12 days, and now her scar has all but vanished. Sheba was pretty miserable for the two weeks in which she had to lay low and rest in her crate, (with that embarrassing "cone of shame" stuck on her head!) but within just a couple days after removing the stitches, she was right back to being a typical, over-energized, over-sized German Shepherd puppy once again! You may recall that Sheba has had a tough time of it over the past couple of months, having suffered through two severe Panosteitis flare-ups, which caused her to stop eating altogether, leaving her far below her ideal weight, and noticeably weakened. Even at the best of times it has been a constant struggle to get her to eat. During the second bout of Pano, she lost a ton of weight in a very short time, and right when she really couldn't afford to lose any. But for some reason, since getting spayed on March 5th, Sheba has decided that she actually enjoys eating... and is in fact eating so much better than she ever has since day one! And she's so full of energy now, and is in the midst of yet another major growth spurt! Although still quite thin, she has grown to be a very tall girl... and very long! Sheba weighed in today at a whopping 66 pounds, and stands a towering 25-3/4 inches at the shoulders. 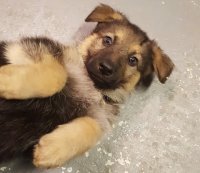 It's worth noting that the average fully-grown female is just 23-1/2 inches tall, and weighs 59-1/2 pounds.... so, at less than 7-1/2 months old, she is already taller, longer and heavier than most adult German Shepherds. As this breed is not considered to be fully-grown until at least two years of age, this means that Sheba has another 16+ months to go before she is "full-size"... Yikes! Sheba continues to be such an amazing dog... intelligent beyond belief, absolutely stunning in the looks department, and she has not one mean fibre in her being! She's such a huggy-kissey/snuggly kind of girl, and she loves nothing more than to curl right up tight with Linda or myself, or with her sister Chrissy, our 10 year-old purebred Shih Tzu. Sheba has never gotten into anything she wasn't supposed to... not even once since we first brought her home. She learned right from the start to only chew her own toys, and has never gone after anything of ours... no furniture, flooring, keys, cellphones, slippers, food, clothing, cords, or anything else that isn't hers. If we had to list one miniscule flaw, it would be that she enjoys having grass in her mouth... mind you, she won't actually eat it... just chews it for a few seconds, then spits it back out! She's been OK with the grass thing lately, only because it's currently buried under the snow, but in another week or two she'll likely be right back at it again. But I suppose if this is her only "fault", well... that pretty much makes her a perfect angel in our books! Our trip to Gander for Sheba's spay surgery last week was an interesting one. As she would have most certainly become frightened and anxious if left alone in the car for the noisy one-hour ferry crossing, we had no choice but to take her to the upper (outdoor) level via two outside staircases which were extremely icy and snow-covered, and it became a treacherous undertaking for both us and our pup. The poor girl was scared half to death of these slippery, open steps, and it took everything we had to eventually get her up there without any serious injuries, (for her or us!) with me pulling and Linda pushing! And it was indeed a frigid day to be out there in the snow, below-freezing temperatures and strong winds, with Sheba wrapped up in blankets as best we could. I think there needs to be a better solution for getting our pets above deck and into a safe, warm environment. Once we had finally made the crossing, one of the ferry workers felt so badly for us that he offered to allow Sheba to come in through the lounge and into the elevator, (after everyone had returned to their cars) as there was just no way that she was going to get back down those stairs in one piece. (although still just a pup, she is already very large and heavy, so carrying her was not an option) How nice it would be to have just a small indoor sitting area for our pets who cannot be left alone in their vehicles, and even more importantly, for those of us who are disabled/in poor health, perhaps returning home after a cancer treatment or surgery, etc., now that no one is allowed to remain seated in their vehicles on the lower deck. Due to my own disability, for the past ten years I have always remained seated in our car with my doctor's note as backup, but now with said note being useless, I had to tolerate the hour-long crossing while in great pain by sitting upright on the open upper deck, as opposed to being fully reclined in our car. Well, it was even more difficult than I had imagined, and for this reason I cannot leave the island again until either there becomes some place where I would be able to recline/lay down in relative comfort, or perhaps make it so that passengers can sign a waiver so that the provincial government would not be held responsible in the event something serious happened. I am certainly not the only one in this predicament, nor are we the only ones unable or unwilling to leave our pets alone in the vehicle. So yes, our government needs to be made aware that not everyone is able to get/stay above deck, and not everyone can leave their pets unattended, for various reasons. For our return voyage Sheba remained in the vehicle, as she was still very groggy from the surgery and thus did not get too stressed/frightened. The surgery went well, and Sheba was in and out of the operating room in record time. After we dropped her off with the vet, we next drove over to the Nissan dealership to pick up our shiny new 2018 Rogue (SL Platinum Edition) AWD SUV. By the time we received the keys to our new wheels and had returned to the vet's office, Sheba was out of surgery. She had the luxury of spreading out in the spacious rear of the new Rogue for the return trip home to Fogo Island, and I am certain that she found it a much more pleasureable experience than being squeezed into that tiny rear seat of our convertible! Both of us are loving the new Rogue! It drives like a dream, and is very spacious, and packed full with so many options that it is difficult to keep track of all the high-tech goodies. It is a very plush and incredibly comfortable automobile, and luxurious charcoal grey leather abounds throughout the cabin... on the "zero gravity" NASA-designed seats, and also adorning the door panels, dashboard, steering wheel, gear shift lever, even the centre console is leather-wrapped. It also features an enormous automatic panoramic moonroof which is an awesome visual experience for both the front and rear passengers, as almost the entire roof, front to back, is a huge panel of glass, and this can be made to completely disappear in seconds with a mere flick of a switch! Last week I found some really deep snow, so I put the Rogue through its paces... WOW, I can't believe what it can go through! And last week we had about a foot of snow in our steep driveway, and we could back it right up the slope without so much as spinning a wheel. So, unless we get the kind of blizzard again which completely buries cars, we won't even have to shovel the driveway! We should have gone the all-wheel-drive route years ago! So anyway, Sheba is doing much better now, after resting in her crate (wearing the dreaded "cone of shame") for the past 10 days. She has a sizeable incision, (about 5 inches long) but it is healing up nicely. We're going to attempt to remove the stitches on the weekend, and if we can't manage, we'll ask a nurse who lives nearby to give us a hand. It is interesting to note that since her surgery, Sheba has developed a HUGE appetite, for the first time ever! She has always been a VERY picky eater, (just not at all interested in food of any kind, just like her mother) and we have always had to practically force-feed her, but since she came back from the vet we just can't get food in her fast enough! Its a good thing too, as she had lost several pounds in just one week, during her second serious bout of Panosteitis, right when she should have been gaining weight like crazy (at about 6 months old) Sheba has always been very thin for her size. She's already taller, and longer, than the average fully-grown female German Shepherd, and her large size just makes her look even more thin. But I think she has gained much of her previous weight back during this past week or so. I would have loved to have weighed her this week, (she turned 7 months on Tuesday) but we thought that attempting to lift her onto the weigh scale might place too much of a strain on her incision... but I am thinking that she must be up in the 62-64 lb range now, so although she is still too lean, she's just beginning to finally fill out a little. Chrissy's skin issues are much improved, but it will always be an ongoing thing. She seems to be seriously allergic to almost every type of medication, even antibiotics, so we had to stop all the meds, and we are now relying on the daily medicated shampoo treatments to help keep the yeast in check. At over $30 for a small bottle of the special shampoo, it certainly isn't cheap! And then there's the hydrocortisone spray to help with itching, with a tiny 2 ounce bottle selling for over $40! But at least she's improving, and her hair is now coming in thicker. She's currently snoring LOUDLY beside me as I write this, with all four of her feet sticking straight in the air. Hard to believe we've had our lovely little girl for 10 years!! Yikes, where does the time go! I am happy to report that Sheba has bounced back nicely from her second serious bout of Panosteitis, having regained all of the weight she previously lost. She is now 28 weeks old (as of yesterday) and weighs in at 58 lbs. She's quite tall, at 24.5 inches. It is such a relief to finally see her energy level returning to where it once was. We now have a fair amount of snow on Fogo Island, and Sheba is always itching to get back back outside for more fun, running and diving head-first into the deepest drifts that she can find! It is an ongoing struggle to get Sheba to eat; she just doesn't get excited about food the way other dogs do. I may have mentioned this before, but she is a very finicky eater, and has now decided that she doesn't like eating out of her bowl, and will only eat kibble which we have stuffed into her KONG toys instead! (or perhaps a few strategically placed piles on the floor!) Let's hope that this is just a phase! We have an appointment in Gander next week for Sheba to get spayed. She will be just shy of seven months old, and our vet has recommended that she have this procedure done soon after six months of age. The preferred age to spay/neuter can be a touchy subject, as many dog owners believe that no dog should be fixed until they are fully grown. 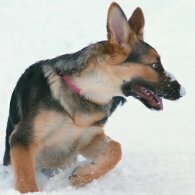 (in the case of a German Shepherd, this would be 24 months) However, every vet we have had over the years has recommended doing it at six months. It is also worth noting that every dog that I've had since childhood was spayed/neutered at six months, and all of them went on to lead long, healthy/happy lives. We will also be picking up our beautiful new all-wheel-drive SUV in Gander next week. As Sheba is getting too large to squeeze into the rear compartment of our sports car, we've decided that we require something more spacious, and with a lot more storage room than our present car provides. (no, we will not be parting ways with the convertible... it's way too much fun!) So, we are now the proud owners of a brand-spanking-new, luxurious 2018 Nissan Rogue "SL Platinum" all-wheel-drive SUV, fully-loaded with every option imagineable. Now we will have tons of room for ourselves, both dogs, and all of our stuff... and Nissan's advanced AWD system and long list of high-tech safety features will be great for when Linda is traveling to/from work in poor winter driving conditions. Sheba is now into her second serious bout of Panosteitis, (an often crippling bone disorder commonly seen in large breed dogs, and is actually a form of growing pains) "Pano" can often create serious pain in fast-growing leg bones. Although she doesn't seem to be in a great deal of pain, (doesn't whimper when rising/standing/walking) Sheba has had no appetite over the past week, and has not been drinking much at all. She has always been a rather finicky eater anyway, but from Saturday to Thursday we could not even coax her to eat more than just a few hand-fed kibbles here and there. She had taken a couple Beggin Strips and MarroBone treats periodically, but we couldn't help but wonder how long she could possibly go without a real meal, or without water. Surely a dog won't allow themselves to starve, will they? As many of you know, we live on an island in the middle of nowhere, and at this time of year a trip to the vet can be, at best, a 12 hour journey, and sometimes even a two or three day ordeal, due to ferry breakdowns, heavy sea ice, hurricane-force winds, bad roads, etc, etc; obviously if Sheba is not going to start eating again soon, we will have no choice but to take her to the mainland to get looked at. This is Sheba's second Pano flare-up in the past few weeks. She had it in her right front leg the first time, and during the seven days that it was acting up she ate less than usual, but was at least still eating. This time it's in her right hind leg. She is still able to walk around on it a bit, and seems to have little trouble getting up and down, but she prefers not too... has spent the past several days mostly lying down, and only ocassionally playing with a chew toy or snuggling up with us, but doing little else, which has been so out of character. I should add that Sheba has not been officially diagnosed with Panosteitis, but we're quite certain that this is what she has, as the pain commonly migrates from limb to limb. Flare-ups generally last from one to three weeks, but these symptoms can keep recurring until about two years of age, when their bones have finally finished growing. If we do end up having to take her in, they will look into it, take x-rays and whatever else they do. We're pretty green when it comes to this stuff, (after a 25-year German Shepherd hiatus...) and it's quite distressing to see our dear girl go for so long without wanting to eat. So it's indeed been quite hectic and stressful around here this week, with both of our doggies now under the weather. Chrissy (our 10-year-old Shih Tzu) has not been reacting well to her new meds for a chronic skin (yeast) infection, so between the two pooches we've had almost no sleep for the past several days. We are in contact with our vet clinic, so they have been doing all that they can for Sheba and Chrissy over the phone. We may still have to make the trip in, depending on how the next few days go, but I want to add that Sheba has started to develop a wee bit of an appetite as of Thursday. Little Chrissy though... she has had non-stop diarrhea and vomiting, so she too has been keeping us hopping, the poor thing. She has somehow kept her appetite up for the most part, but when she would eat anything it would come right back up... and out... Yuck... Luckily, Chrissy is a little fatty, so at least she won't fade away to nothing anytime soon. But Sheba is a constant worry, as she has always been quite lean, and after days of not eating/drinking, I'd swear she already looks much thinner. *UPDATE* Today (Friday) Sheba is looking a little more lively, and though she is still not taking her regular food, she's had a fair amount of rice/broth/chicken, and is drinking again; (though not enough) she's looking more alive than she has since last Saturday. We have taken her outdoors a few times today for some very brief, light exercise around the yard. Though I am dealing with another particularly severe round of spinal pain which has kept me mostly bedridden for much of the past week, I did manage to get downstairs for awhile to cuddle and play with Sheba today, and she seems to possibly be on the mend. (fingers crossed!) She still has the limp in her right hind leg, but it doesn't seem quite so pronounced, and it appears to not be bothering her too much. She has most definitely lost significant weight though... gosh, she looks noticeably thinner in just these past five days, and it is quite distressing to see the change. But hopefully in the coming days Sheba will return to her proper diet, and will put some of that weight back on. It has been suggested to us that Sheba could possibly be coming into heat, and that this may account for her being off her food, and very clingy. But we're not seeing any other signs of this yet, and at less than six months of age it would be a little early for her, but we'll be watching closely. Anyway, it appears the worst just may be over, we hope. We will be discussing with our vet if we need to be substituting her puppy food for adult, or giving her supplements, or vitamins, or whatever it is that we need to do, to help ease the crippling effects of the Panosteitis. It is interesting to note that both times that it's acted up has been within 24-36 hours of a sudden and substantial increase in Sheba's height. (last Saturday she was, unbelievably, a full 3/4" taller than she was just a day or two prior!) For such a young dog she is already very tall; (about 24" at the shoulders) I would think that a much slower-growing dog would most likely have less severe symptoms of these growing pains. As for Chrissy, her illness is most definitely a reaction to powerful antibiotics which she has been prescribed for a chronic skin condition. We were once again up all night long with the poor thing, and we have decided to stop giving her the pills. Late today Chrissy was showing some signs of improvement. She has also been prescribed a daily topical spray (with hydrocortisone and aceponate) and a special medicated shampoo which must be applied daily, in addition to two other powerful anti-bacterial/yeast meds, all of which are to help combat her infection, so we're hoping she can overcome this condition without the potent antibiotics added to this complicated mix. Here's hoping that Sheba and Chrissy will soon be back to their cheerful, healthy selves!! *UPDATE* Sheba has shown some improvement today. (Saturday) She is eating more, (loves turkey!) and has been outdoors exercising more. We have been filling up her KONGs with kibble and she's been eating a lot of it. Chrissy has been having a tough time with the Atopica, (liquid meds) just as she did with the antibiotics, so we have made the decision to cease all of her medications. It has been too hard on her little body, and we hate to see her suffering. This morning she didn't want to take her meds, but when she finally did, she was sick for most of the day, so we decided to stop all of it. From now on she will just get the daily medicated shampoo. Her skin is very much improved, and she had perked up a lot by this evening. Sheba continues to grow like a weed! She is 24 weeks old today, and weighs 55 lbs, a increase of two pounds since last Saturday. She now measures 23.25" at the shoulders. Over the past week Sheba has been limping a little, a common ailment of fast-growing German Shepherd puppies. It is simply growing pains; the medical term is "Panosteitis", which affects their bones/joints from age 5 - 18 months. In more severe cases pain meds may be required, but it hasn't appeared to be bothering her, and has not slowed her down at all. As of today the limp has disappeared... at least for now. Sheba is now five months old!! And wow, what a beautiful dog she has turned out to be! She's truly one-of-a-kind... German Shepherds are not generally known for being cuddlers and huggers, but Sheba certainly is. She just loves to be held tight, and kissed, and she reciprocates by wrapping her "arms" right around us, and kissing us right back, as she practically begs for a belly rub. We have noticed in just these last few days that Sheba appeared to be in the midst of another major growth spurt, after a few weeks of lesser gains. She's been looking significantly larger, with her face and neck noticeably thicker, so I placed her onto the scales today and, sure enough, she has gained three more pounds in just the past six days! So at five months of age she weighs a whopping 52 lbs, yet she still is quite slender. Sheba is also getting taller, now standing almost 23 inches at the shoulders, which is the average height of a fully mature female, even though she still has about nineteen more months of growing to do yet! Sheba has lost seven baby teeth (that we know of!) just this evening. She's been a bit late getting to the teething stage, so I guess she's just making up for lost time! She has been unable to bite down on her hard chew toys with much force in recent days, so we have been giving her frozen dish towels to chew on, to help soothe her sore gums. Tonight we gave her wet food only, without any dry, as she was unable (or unwilling) to chew her kibble. But she still has her appetite, consuming a whopping six cups of food daily. I mentioned in my previous entry that our dear, sweet Sheba is just a big "scaredy-cat" in disguise. Well it's certainly true, and we have further evidence to support the theory that she will most likely never be mistaken for a truly frightening attack/guard dog any time soon, at least not in this lifetime! You see, the delivery man came to our door today with our latest shipment of dog food, (several large bags of Actrium Holistic kibble, six cases of canned Pedigree "Choice Cuts", and a couple gigantic bags of "Beggin Strips"... both dogs' favourite treats) and by the time Linda had answered the door, poor Sheba, scared completely out of her wits, was already in full retreat at lightning-speed out of the kitchen, through the Iiving room, and into the bathroom, after losing her traction and wiping out while rounding a corner and taking a hard fall that produced a loud bang resonating throughout the house, (this sent me scrambling out of bed and down the stairs to see what all the commotion was about!) but not before she thoughtfully left behind a small "gift" on our area rug, in the midst of flying through the living room to escape the frightening beast at the door!! Seems our delivery guy had literally scared the sh** out of our Sheba! Sheba turned 20 weeks old on the weekend. Her weight increased by another two and a half pounds over the past seven days, and she's now at 47.5 lbs, (as of Dec 30) which means that she'll definitely weigh over 50 pounds by the time she is five months old. (on Jan 12th) Sheba currently stands a bit above 22 inches at the shoulders. A very big girl... just not very brave!! «This is the picture from back in September which convinced us that we needed to increase the population of our household by one! Sheba was just four weeks old in this photo, taken by the breeder to be posted in an online listing, advertising the puppies for sale. I immediately replied to the ad, discovered that Sheba was in fact the only remaining puppy out of a litter of seven, (4 males and 3 females) and we just knew that we had to have her! The breeder then proceeded to send us photos of both parents, and we knew that if Sheba turned out to be even half as stunning as both her Mom and Dad, then she was going to be a spectacular dog indeed! And the rest, as they say, is history. We have now had Sheba with us for two and a half months, and on Saturday she will be 20 weeks old. She currently weighs 45 lbs, and stands 22 inches at the shoulders... which is actually the average height of a fully grown (two year-old) female, let alone a mere puppy of just 4.5 months! Sheba weighs more at four and a half months, than an average female at almost six months, so it looks as though she is going to be "jumbo-size"! Sheba is getting close to that size where people will start to think twice about approaching her; she already has that slightly intimidating German Shepherd "look" about her, but the funny thing is that she's really just a big scaredy-cat! Just today, Sheba wanted to play with her KONG ball with Chrissy, (our little 10 year-old Shih Tzu) but this bothers Chrissy to no end, because the ball is just too heavy/large for her tiny mouth to pick up. Well, Sheba kept pestering her to play with it, and Chrissy finally got fed up and, with a frighteningly loud growl, chased poor Sheba clear through the house, across the living room at warp-speed, up onto the sofa, and into Linda's arms for protection! Well, we nearly died from laughter, seeing our tiny fur-ball Chrissy scaring the daylights out of a big, tough German Shepherd!! It's a good thing that we don't have intruders here on Fogo Island, because I think Sheba would much prefer to be cowering behind us, rather than standing guard out in front protecting us! Now if we could get her to just sit there and look tough, any intruder would likely scream and run when they see her! But a bigger softie just does not exist! Sheba has not been very pleased these past few days, as we have been experiencing hurricane-force winds since Christmas Eve, reaching 130 km/hour for the past several days, so she has not been too thrilled to have to go out into that nasty weather to do her business. But out she goes, because she is just too much of a lady to use an indoor pee pad, as that is only for puppies! So she has been braving the brutal winds every few hours, but it's obvious that she is not very impressed with Fogo Island winters! Anyway, the worst of the storm appears to be over, as the winds have diminished dramatically over the past few hours. (down to just under 100 km/hour last time I checked) Surprisingly, our electricity has somehow managed to stay on for the duration, so at least we didn't freeze! The other issue is that due to the strong winds and high seas, our Fogo Island ferry has been out of commission. As if this isn't bad enough, the large ferries which connect Newfoundland to the mainland have been unable to make the Cabot Strait crossing most days over the past couple of weeks, so our store shelves are quickly emptying. Also, we order our dog food from the mainland and have it shipped to us, so with the ferries unable to deliver goods to NL, we are running dangerously low on both kibble and canned food. Hopefully within the next day or two the weather will have improved enough to allow the ferries to run once again, and we'll soon be seeing our latest shipment of dog food showing up at our door. If not, Sheba and Chrissy may soon have to resort to eating peanut butter sandwiches and pizza! Sheba turned 4 months old on December 12th, and weighs a whopping 43 lbs. We believe that Sheba has begun teething. She is taking longer to eat her meals, and she doesn't want to play outside for as long as she previously has. Also, she spends more time laying around and napping... and wanting to chew things. As she is now at 4 months of age, it is most likely that her adult teeth are beginning to emerge. Sheba is still eating well, (approx 6 cups/day) but it now takes her longer to do so. We're thinking that she may be finding it a little uncomfortable to eat because of her inflamed gums, so we have begun softening up her kibble first, to make it a little easier to manage. We also freeze wet dish towels for her to chew on... this helps to reduce the swelling and pain that comes with teething. Over the past few weeks Sheba has become so loveable, huggy, affectionate! She is such a big spoiled softie! She is growing up SO fast, and getting SO big! It feels like we have missed the whole puppy stage, as within just days of bringing her home at eight weeks, she had so quickly begun looking more like an adult than a puppy! She is incredibly laid back for a German Shepherd pup, which are notoriously wound up like a top 99% of the time... But she is too much of a lady to carry on like a little devil child, and is the calmest, most refined young lady. Sheba LOVES to be around us ALL the time, and often makes the rounds to get lots of hugs and kisses... and full body massages, taking turns between Linda and myself... no, she is not spoiled in the least! She follows us all over the house, (I doubt that we will be alone in the bathroom ever again!) and when Linda is sitting on the sofa Sheba is always laying right there at her feet; in fact her head and paws must always be resting right ON Linda's feet. She loves to play fetch, and always sits when we ask her to, prior to throwing her ball. And she always, without fail, lets us know when she must go outdoors to do her business, and never has any accidents indoors. Sheba continues to get more stunningly beautiful every day, and she rarely gets overly excited, and seldom misbehaves at all... she is indeed more laid back than any GSD puppy on the planet. She always tries to get Chrissy to throw the ball for her! She just cannot understand why little sister Chrissy won't throw the ball when she brings it to her! Chrissy will sometimes go out of her way to antagonize Sheba. I think that after a decade of it being "Chrissy's house", she believes that SHE is the one calling the shots, and she'll deliberately try to get a rise out of Sheba, just because she CAN! I think she actually enjoys trying to get her sister in trouble, and it frustrates her to no end to see Sheba being such a perfect little lady... and too clever to rise to the bait. Today both dogs laid around the house all day long, (neither one of them wanted to deal with the cold and wind, and knew that napping was the perfect solution) They both slept all afternoon, with only a few inches separating them, and they got along just fine. But sometimes if Sheba gets her face right into Chrissy's, Chrissy will put on a show as though she is nothing short of a wild beast about to bite her head clean off. Of course it's all in good fun, but it is hilarious to see little Chrissy make such a valiant effort to scare Sheba out of her wits!... she bolts away from the little furball like a scared rabbit! As I mentioned earlier, Sheba, at just 4 months old, is already looking very much like a fully-grown Shepherd. I have posted images of her online, and everyone comments on her stunning looks. We definitely hit the jackpot with her, just as we did with Chrissy almost a decade ago. Sheba is a beautiful dog who looks VERY much like her equally stunning parents. We recently learned from the breeder that they are no longer planning to breed them again. Such a shame, as we had already had our hearts set on snagging another one of their beautiful puppies. Sheba returned to the vet's office in Gander today for her third DHPP (Distemper, Hepatitis, Parainfluenza, Parvovirus) inoculation. Another full physical examination shows her to be in perfect health. Her weight/height is substantially above average, though she remains quite lean. Sheba returns to the vet in February to be spayed, (at six months) and will receive her rabies vaccination at that time. Sheba is now almost fully weaned onto the higher-grade kibble. She now receives a full cup of Actrium Holistic puppy food, a quarter cup of the old Iams "Proactive Health", and a half cup of Pedigree "Choice Cuts", (wet) three times daily, which works out to 5.25 cups/day. Definitely a hearty eater! She has begun to "blow" her puppy coat this week. Course, wavy adult hair is coming in on her back now, replacing the fine downy puppy fur. Linda has been kept busy with the vacuuming, as the fine, soft hairs of her old coat are finding their way into every nook and cranny! It's hard to believe how fast Sheba is growing up. As of today, she weighs 34 lbs, and stands almost 19 inches at the shoulders. Her favourite games are fetch and tug-of-war. And she can keep herself entertained indefinitely, simply by chewing on her various KONG toys, and by kicking them around the living room like a professional soccer player! Linda took Sheba to Gander for her vet's appointment this past week; she had a complete physical examination, (as required for her new medical/health insurance policy) and received her 2nd set of immunizations. She was given a clean bill of health, and weighed in at 21.5 lbs. Sheba has gotten over her initial lack of appetite. We are unsure whether it is because of the change in her new diet, (Iams "Proactive Health" mixed with Pedigree "Choice Cuts") or perhaps because she is simply more accustomed to her new surroundings. But either way, she LOVES to eat now; is devouring three good-sized meals each day, eating about 1-1/4 cups at each meal, so 3-3/4 cups per day... She is quite lean but with a large frame for a female, so the vet said to just keep going like this, as there is not an ounce of fat on her, and she is obviously very healthy. We are soon going to start slowly weaning her off the Iams and onto the higher quality Actrium Holistic, and will continue to mix it with the Pedigree Choice Cuts, which she absolutely loves! Both of these foods are of very good quality and are priced quite reasonably; we can order them online from Walmart.ca and have it shipped right to our door, so when you live on a remote island with extremely limited local pet food options, this is like a dream come true! Sheba is now house-trained; such a good, smart girl! But wow, the way she can instantly go from mellow and laid-back, to suddenly morphing into an amped-up Tasmanian Devil, is just like flipping a switch! She seems to have energy by the boatload, but just as quickly she gets drained again, and will be down for the count, snoring like a drunken sailor in no time at all! When Sheba is wound up like a top, Chrissy just stares at her as if to say "what is your problem girl!" On the day that Sheba went to the vet's office, everywhere she went, people were gushing all over her! Seems EVERYONE loves German Shepherds! As the travel crate that we had used to transport Sheba home from Corner Brook almost three weeks ago is now far too small for her, and because a larger crate will not fit inside our convertible, Sheba and Linda had to sit outside in the cold wind on the upper deck of the ferry, because no one is allowed to stay on the lower (car) deck, and we are not yet ready to leave her alone in the car for the crossings. (no pets are allowed in the passenger lounge either) We recently heard a horror story about a puppy that had completely destroyed a car's interior during the one hour crossing to Fogo!! Thousands of dollars in damages... Yikes! While they were sitting outside on the ferry, many people came to visit Sheba, and they all fussed over her, and talked about how beautiful she is. Even at the vet's office, the receptionist immediately picked her up, gave her a big kiss, then made the rounds with her, from room to room, showing her off to the vets and other support staff, and they ALL fell completely in love with her. Of course Sheba was just lapping up all of this attention! Even the ferry workers had all gathered around her during the ferry crossing and were commenting on what a gorgeous dog she is. Everyone says she is going to be "a real stunner as an adult", and we couldn't agree more... she seems to get more beautiful each day! So Sheba is a very healthy girl and is strong as an ox, and she handled the journey to Gander very well... this was her first time in the car since the day we brought her home... seems like ages ago, but in fact has only been 19 days. We want to get her out in the car more often in the coming weeks, to get her accustomed to traveling. I am taking many pictures of her, as the puppy stage comes and goes so quickly. They grow up far too fast! Sheba is now just over ten weeks old, and she has been with us for almost two weeks. She started out as quite a finicky eater, but has since developed a huge appetite. She already weighs 20 lbs, and is growing incredibly fast. If the size of her paws and length/thickness of her muscular legs is any indication, she is going to be a very big girl indeed! She is a truly outstanding specimen of the breed, with perfect posture/proportions, markings, colours. She has her father's stunning physical characteristics, (in fact she looks almost identical to photos of her Dad when he was this age) and displays her mother's remarkable intelligence and mannerisms. Sheba's lovely ears made the remarkable transition from floppy to stiff overnight last week, at just nine weeks old. This generally does not happen until at least 4 to 5 months of age, and often not until almost a year, but she went from looking like a little puppy to a grownup in mere hours, at just over two months old! Today, after scratching her right ear for about 3 seconds, it was floppy once again... sure doesn't take much to take the stiffness out of them at this early stage. Her ears will likely go up and down several more times in the coming weeks/months. We had been planning on placing Sheba back into her travel crate tomorrow for her vet appointment in Gander, but there is just no way that she will fit into it now... and a larger crate will not fit in our little sports car... so Sheba will have to exit the vehicle once we are on the ferry, as we don't want to risk her devouring our convertible's immaculate leather interior! (after all, she is a puppy and loves to chew!) And as pets are not allowed in the ferry's lounge, we must sit with her, out in the frigid air on the upper deck, for the length of the crossing. Brrr! Sheba will get a complete physical examination at the vet's office, as required for her health/medical insurance policy, in addition to her receiving the second set of vaccinations, then it's back to the vet in another 4 weeks for her third and final booster shot. So we are hoping the car ride goes well tomorrow, with no upholstery getting chewed, no vomiting on the seats... or worse! Turns out that Linda will be making the journey without me, as I am under the weather, so we're really hoping things do not go too badly! Two days ago we traveled to our province’s west coast to pick up our new purebred German Shepherd puppy. It was an epic 17 hour journey, (including two ferry crossings) but it was absolutely worth it to finally get to see and hold our precious Sheba. Due to my ever-present spinal issues, needless to say, I spent almost the entire next day flat on my back in bed in recovery mode, while Linda entertained Sheba. But I would come downstairs periodically to play with her too, and she would smother me with love, and vice-versa. She is beyond adorable! I am absolutely dumbfounded at how perfect Sheba is! We have been constantly reading/hearing about how wound up/hyper these little beasts are, yet Sheba has been quite content to simply curl up at our feet, have a snooze, squeak a toy, snuggle, and have another snooze. All day long. Though not yet 9 weeks old, Sheba is already large enough to look over the TOP of our baby gates! And she is miraculously capable of holding her bladder for hours… something which is unheard of for GS puppies. When we picked her up on Tuesday we drove for many hours before our first stop... while she slept! The entire way! When we eventually reached the ferry crossing we had another 2.5 hour wait, but she still didn't have to go, preferring instead to explore and try to eat tasty rocks! Sheba is already an expert at flying up and down stairs, but as Chrissy (our 9 year-old purebred Shih Tzu) was under the weather and staying in bed upstairs, we told Sheba that she must stay downstairs, and she does. No gate required. We said "stay", one time, and she knows to stay... does not even attempt to sneak up the stairs. When we picked her up, the breeder said that out of the entire litter, Sheba is the calmest, and seemingly the most intelligent, displaying all of the traits of her mother, and the physical characteristics of her father. And to see her parents, we are thrilled... they are truly magnificent specimens. Sheba was always content to watch her siblings carry on like lunatics, while she would sit back and analyze the proceedings, reflecting on their childish behavior. Sheba is definitely NOT your typical German Shepherd (aka Tasmanian Devil) puppy! And she is pretty much completely house-trained at just 8.5 weeks. We did not expect this at all. How did that happen? Sheba tried to give me a tiny bit of a nibble when she was snuggling/hugging me, so I gently told her no, and the poor creature looked crestfallen. She never nibbled again, but very gently licked and kissed us both to death. After less than 24 hours with our new family member, we were both completely smitten. Needless to say, we have already told the breeder that if she decides to breed these two again, we will take another! Chrissy had taken quite sick a couple days prior to our journey, and she only got worse as we were traveling. But she has since made a very quick recovery, considering how ill she was, (non-stop throwing up, constant diarrhea, very listless, etc.) and we were planning an emergency vet run. But today she is already completely back to her old self… very playful, snuggly and happy, and she has her appetite back. We believe her problems were from the long, heavy dose of antibiotics for a skin condition, (rash) which has since cleared up entirely. As soon as we stopped her meds, she improved almost instantly! And this is quite a surprise… Chrissy (who has only ever been around one other dog in her life) and Sheba spent the entire day together today, and as it turns out, they get along famously!! They even take their naps practically side by side. Chrissy will walk right up to Sheba (who is already close to double her size!) and gives her kisses! We did not expect this much welcoming hospitality from our little diva, particularly right at the start of this new relationship, but are very happy/relieved to know that she will have a dear companion/buddy for the rest of her life. I was finally able to get outdoors with my cameras today and managed to capture a decent shot or two of Sheba, so I will be making a new image gallery section for our doggies within the next few days. We are about to acquire another family member! In just 11 more days we will be traveling across the province to pick up our little (BIG!) 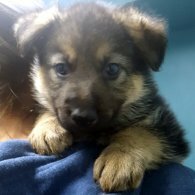 Sheba, a gorgeous 7 week old purebred German Shepherd puppy of the highest pedigree. Once we saw the beautiful parents we just knew we had to have her! Sheba is a truly stunning specimen; so healthy, happy, and growing like a weed. She is going to be a very big girl... we can clearly see significant growth from one week to the next, as the breeder sends us our weekly photos of our girl. As expected, I will soon have a new photo gallery section added, showcasing our newest addition to the household. Stay tuned!